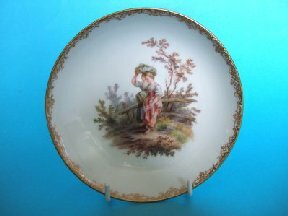 A Superbly painted Meissen saucer from the mid 18th.Century. Painted to the centre with two barefooted peasant girls in a landscape. Typical gilt border. Measures 13.8cm. diameter. Good, no damage or repairs. Very little wear. 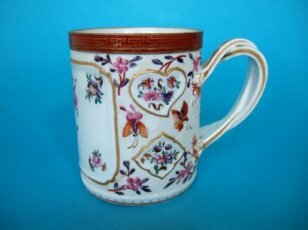 An attractive French Samson factory mug or tankard in Chinese famille rose style. Moulded with reserves on a 'Chicken Skin' ground. The reserves picked out in gilding and painted with flowers and insects, The entwined handle with flower terminals picked out in gilt. The unglazed base with a faint enamel Samson mark. Stands 9.3cm. (3.65 inches) high and 7.7cm. (3 inches) diameter at the rim. Very good, slight gilding wear only. No chips, cracks or restoration. An Attractive Ludwigsburg Marked Tea Canister & Cover. A late 18th. 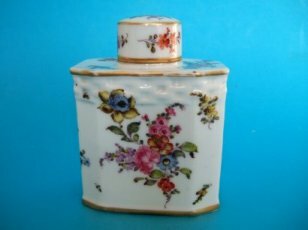 or early 19th.Century German hard paste porcelain tea canister and cover. Of rectangular shape with chamfered corners, the shoulder with a band of moulded basket weave. Painted in polychrome enamels with flower sprays and scattered sprigs in typical German style. Marked in underglaze blue with the crowned interlaced back to back 'C's of the Ludwigsburg factory. Measures 11.5cm. (4.5 inches) high. The last picture shows a collectors identification card that comes with the canister. Quite good. A very small chip to the edge of the foot and a little wear to the gilding. 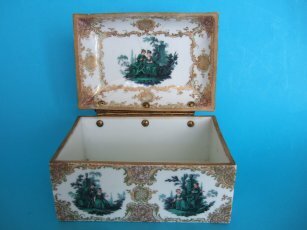 A lovely Continental porcelain box 18.3cm. long. Decorated in 18th. Century style with numerous Watteauesque scenes of lovers in parkland landscapes. All painted in green monochrome with flesh tones. All enclosed in intricate gilt scrollwork and with flower sprays to the cover. Measures 18.3cm. long. 12.5cm. wide and 9.7cm. high. No marks to the unglazed base. Probably of Dresden or French manufacture. Unfortunately the cover has been broken and repaired. The repairs are secure and could be made less noticeable with a little sympathetic restoration. The base of the box is undamage save for slight chips to the lower edge.